How money and debt are described in simple economic models colours economists' interpretation of real world monetary systems. My feeling is that money is somewhat superfluous in these models, but it is necessary to understand why that is the case. This article explains how money and government debt (Treasury bills) operate in the second simplest Stock-Flow Consistent (SFC) model in the textbook Monetary Economics by Godley and Lavoie -- model PC (Portfolio Choice; found in chapter 4). If the reader is familiar with mainstream models -- like Dynamic Stochastic General Equilibrium models (DSGE) -- the treatment of money and debt is generally similar to model PC. There are a number of convention differences, which means that the formulae look different, but they quite often imply the same behaviour. The real differences show up in the philosophy of the solution of the model, which actually should not affect how money and debt operate as instruments. In interests of brevity, I will defer the discussion of the differences to later. However, understanding how money and debt work within a SFC model -- which can be cleanly solved -- will prepare readers' understanding of the more poorly-defined DSGE models. Model PC is found in Chapter 4 of Monetary Economics: An Integrated Approach to Credit, Money, Income, Production and Wealth, by Wynne Godley and Marc Lavoie. This text has become the standard for learning about SFC models. It is a textbook, and so it may be imposing to readers who are less mathematically inclined. This article (and similar ones) aims to give a non-technical overview to the topic; either as an aid to understanding the text, or at least to introduce the basic concepts. The text itself contains a lot of information, which my summaries cannot hope to cover. For those of you without the text, the models are available online at the sfc-models site: http://models.sfc-models.net/ Shown below is a screenshot of the Excel spreadsheet version of model PC. You may be able to relate the variables within the spreadsheet to my diagram (although my labelling might be slightly different). The number of equations is impressive for what is actually a fairly simple model. We start of with the flows in the SIM model, as shown above. (Note that this diagram adds taxes, unlike the diagram shown in the previous article.) This model only has "money" -- which bears no interest -- as a financial asset. It is denoted H within the equations, as it is what is referred to in economist jargon as high powered money. Note that Government Expenditures (denoted G) is an exogenous variable that drives the system; all other variables are determined by it (and the previous stock of government money held from the previous period). The government generally uses deficit financing, issuing money (which it creates at no real cost) in consequence. If money were gold-backed, we would need to track the government's gold holdings within the model, as that would limit the ability to issue money. I have labelled the government as "Consolidated Government." This entity includes the Treasury (fiscal agency) and the central bank. Within model SIM, it makes little sense to dis-aggregate the consolidated government, but that changes when we move to model PC. As discussed in the previous article, the business sector has the apparently magical ability to hire exactly enough workers so that total revenues equals its wage bill. Since the business sector is always just breaking even, it pays no tax. This is unrealistic (perhaps other than the taxation part), but relaxing this assumption greatly increases the model complexity -- otherwise, we need to allow for the business sector to have a mismatch production and sales. That possibility implies the need to track inventory, and business sector holdings of money. The number of "state variables" within the model starts to explode. Although we can solve those more complex models numerically, intuition is harder to come by. 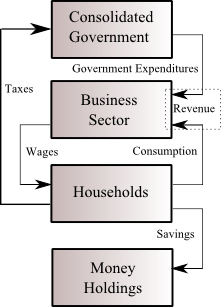 With the business sector behaviour locked down, the diagram makes it clear that there is only one decision to be made within the model -- how will the household sector allocate its income between consumption and saving? Once that decision is reached, all other behaviour is determined by the income flows. The decision itself is reached via a consumption function. The diagram above illustrates the flows within Model PC. There are three functional differences. 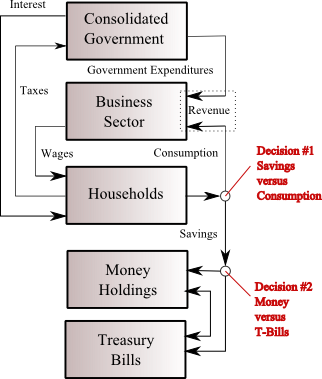 The government pays interest upon Treasury bills (which are only held by households outside the consolidated government). The interest rate on Treasury bills acts as a new external (exogenous) variable. I will discuss how model PC behaves in later articles. In particular, the effect of interest rate changes might not be intuitive. The explanation is found in the text, but the reader may experiment with the numerical models to test its behaviour. The remainder of this article discusses how money is handled in SFC models in general, which generally follows the pattern of model PC. Within the SFC model framework, it is straightforward to add new asset classes, at the cost of increasing model complexity. The decision process is similar -- the household first decides the level of consumption, and then the asset weightings in the portfolio. The issue with adding new assets is how to model their prices. Is it possible to reflect the behaviour of the equity market within a simplified model? The risk is that small behavioural differences can result in completely different outcomes. The deposit convention says that the interest payment made in a period is equal to the previous period's "Treasury bill" holdings times the previous period's interest rate. Since there is a dependence upon the previous period's values, we need to be careful about the time period within formulae. There are a number of economically equivalent ways of defining how interest payments occur -- the only difference between them is that we may need to shift some time series by one period in order to align model solutions. The difficulty is that we are using abstract accounting periods, and there is an fuzzily-defined notion of the "beginning of period" and "end of period" values. The only way to eliminate this fuzziness is to somehow build a model that tracks every transaction, which is well beyond our modelling capabilities. As an example of how time conventions matter, imagine that we have a model household that receives $100 in wages in time period 0 (and has no other financial assets "at the beginning of the period"). Furthermore, the one-period interest rate is set at 1%. It then wishes to buy a Treasury bill in period 0, and then use the proceeds to buy $101 in goods (1% interest). The convention of Monetary Economics is that it bought $100 in Treasury bills (market value) during period 0, and then has $101 available to purchase goods in period 1. Another possible convention is that it buys the Treasury bill "at the end of Period 0", and then it receives the $101 "at the end of Period 1", which means that it can only purchase the goods during Period 2. This convention enforces more of a delay within the system, and perhaps is more realistic. But it raises the question whether the household could sell the Treasury bill during period 1 in order to make purchases at that time point. A fairly nonsensical convention would be that the household buys the bills during the period, then they mature at the end of the period, and it purchases $101 in goods at the period end. I believe that it would be possible to get the model accounting to work, but it would require the ability to allow Treasury bill trading within the model period. (The household would have to buy an existing Treasury bill from a holder at the beginning of the period, which matures at the end of the period.) New Treasury bills would have to be auctioned at the "end of the period." Within the mainstream literature, there is a fair amount of mysticism about the "governmental budget constraint." With SFC models, the dubious "inter-temporal" component disappears (the condition on infinite time horizons), and all that matters is the single-period accounting constraint. All this constraints says is that government accounting properly follows the rules of double-entry accounting. This is not particularly interesting, other than by comparison to some older mainstream models where the accounting was not done correctly. Within model PC, the household decisions are hierarchical. The household sector first decides on the level of consumption for the period. (This is based on starting wealth, interest and wage income.) The remainder is saved, which increases the value of its portfolio of financial assets (money and Treasury bills). The portfolio is allocated between money and Treasury bills. Since money does not pay interest, it is less attractive attractive as interest rates climb. Hence, the allocation function depends upon the level of interest rates. This raises an obvious issue -- how can the household sector change its portfolio allocation? The business sector holds no financial assets, and there are no other non-government sectors. (The foreign sector has not yet been introduced.) Therefore, by process of elimination, the portfolio allocation decision by households must be accommodated by the consolidated government sector. That is, the consolidated government must adjust the money and Treasury bill outstanding amounts to match the whims of the household sector. The mechanism that allows this is the central bank. It holds Treasury bills as assets, and issues money as a liability. Since money pays no interest, and there is no possibility of capital gains/losses on Treasury bills within the model, the central bank earns a steady profit from interest payments on its portfolio. The central bank is then assumed to pay the profits immediately back to the Treasury, so that the total interest cost for the government is just the interest paid on Treasury bills owned by the non-government. Within the SFC model, the level of interest rates is fixed by the central bank (and is external to the model). The amount of money held is entirely determined by the portfolio preference of households. This corresponds to "normal" central bank behaviour, where the policy committee sets the level of interest rates, and the money supply is determined by private sector behaviour; the central bank has to engage in "open market operations" to keep the overnight rate near target. Alternatively, if the portfolio allocation function is obliging, the central bank could target the amount of money in the system. The central bank adjusts the interest rate until the money supply hits target. Within the context of this model, there is no way of distinguishing the targeting regime. This ambiguity has been exploited by some economists who are fixated on the money supply. In the real world, the size of the money supply is driven by more complicated factors. For example, in the United States, banks need to hold reserves against certain types of deposits. The interchangeability of interest rates and the money supply starts to break down. It should be noted that what is discussed in this section has been the object of considerable controversy -- "endogenous money" versus "exogenous money." The one advantage of delving into models such as this is that we can see that much of the debate is a waste of time. Within this model, the notion of Quantitative Easing (QE) makes little sense. (Quantitative Easing in the purchase of bonds by the central bank, in order to increase the size of the monetary base.) The only asset it can purchase are Treasury bills, which are the only instrument bearing a rate of interest. The only way the central bank can increase the monetary base is via lowering interest rates, until it hits 0%. At which point, it is free to push the money/bills allocation around, but that has no effect on households -- it has exactly the same interest income regardless of allocation, which is zero. Broadly speaking, QE does not make sense in the real world either. Since real-world QE operations involve the purchase of bonds, it is possible that there would be some effect on the economy. That would require the use of a more complex model (with more financial assets) to judge. How do real-world monetary systems relate to the model conventions? How does the handling of money and debt differ between a SFC model and a DSGE model? What are the effects of interest rate changes within the SFC model? What's up with "helicopter drops"? I hope to cover some of these topics in later articles.